In the last decade or so, there’s been a reemergence of natural beauty routines. Many beauty companies have even started producing and marketing “natural” products due to the demand from consumers. But even so, there’s some research that a lot of “natural” or “organic” products are still filled with questionable chemicals or reactants. I have tried lots of DIY natural beauty regimens to reduce the chemical products I use and I have found several that are worth a try. If you find yourself offended by your BO and nothing seems to work for it, or last long enough, try using a sliced lemon or lime, and rub it on sweat producing areas as needed. Watch how powerful it is. I’ve tried it many times and I’ve spent the whole day feeling dry and free of perspiration. The only downside to using lemon, or any citrus fruit, is the harshness. It’s not recommended to use this on the recently shaven, irritated, or broken skin. The benefits—it’s the most natural deodorizer you can get. As mentioned above, lots of the products we use have suspicious chemicals. Aluminum hydroxide is in many deodorants and antiperspirants and has been linked to suspicious negative effects. To avoid any fear, make your own deodorant. Most homemade ingredients call for a mix of baking soda, cornstarch, arrowroot powder, and an essential oil. Mix this in a resealable plastic bowl and store at room temperature. It worked wonders for me. It’s a safe option and I’ve never had irritation or burning from using this. Lots of people have dealt with pimples or occasional breakouts. They say exfoliation helps clear dead skin and blemishes. Exfoliating gloves or pads may be too harsh for everyday use, but a weekly mask regimen can help. You can either blend the oatmeal or not, and mix with the honey and lemon juice. Add to your face in the circular motion and leave on for no more than 10 minutes. This is good for those with dry skin. Mix to make a paste. Add to your face and rub in the circular motion. Leave on for no more than 10 minutes and rinse. Moisturize when you’re done. Skin discoloration can be a problem for a lot of us. But for women, dark underarms, and the uneven skin seems to be a common issue. Rather than use harsh bleaching creams, try a cheap and natural option. Lemon is the most commonly known skin lightening agent. Rubbing a slice or cotton ball of lemon juice under your arms daily, will help lighten your skin over time. Do this and let it dry and go about your day. You likely won’t need to use deodorant, because as previously mentioned, lemon works wonders for body odor. Depending on how severe the discoloration is, this may take time. Be patient. Sometimes lemon can be too harsh or irritating for your skin, and if you want to even the skin on your face, it will probably burn. However, potatoes are also a natural bleaching agent and won’t burn. Rub a potato slice on your skin. Leave this on for 10 minutes and rinse. I find that frequent shaving causes dead skin. You can use an exfoliating glove or pumice stone to help remove dead skin, but there are other ways to remove it. Make sure the area you want to shave is wet and has been run under warm water for a few minutes. Then rub in the mixture very well (about a minute) and begin shaving. Then rinse and see how soft your skin is. Use this on your legs, underarms, or all over for soft skin. Soak for about 10 minutes. When you’re done, use a pumice stone to help facilitate the removal of dead skin and rinse. I’ve tried several hair removal techniques, and this one of the most natural ones. All you need is some lemon, water, and lots of sugar. Anybody who has waxed can tell you how painful waxing can be. If you don’t like pain, try sugaring. It’s the best alternative to waxing. Add the ingredients to a heavy saucepan under medium-high heat until a boil. Make sure to constantly stir the mixture. When it boils, lower the fire and let it simmer for 25 minutes, mixing from time to time. The end result should not be too dark but a golden color. Add to a bowl or jar, and let cool. Make sure desired hair removal area is clean, then apply a thin film of the mixture with a wooden applicator or your hands. Let it harden on your skin a bit and lift up. Here’s a great demonstration. Coconut and Olive oils are some of the most common oils used for hair. These oils help provide moisture. They can be used before washing your hair (pre-shampoo), as a deep conditioner, or a daily moisturizer. One of the main benefits of natural beauty routines is the price. You’ll save a lot of money and you’ll also spare yourself from the threat of harmful chemicals. Another great thing is that a lot of these at-home regimens may be more effective at solving your beauty woes, and you can make a product for just about anything. 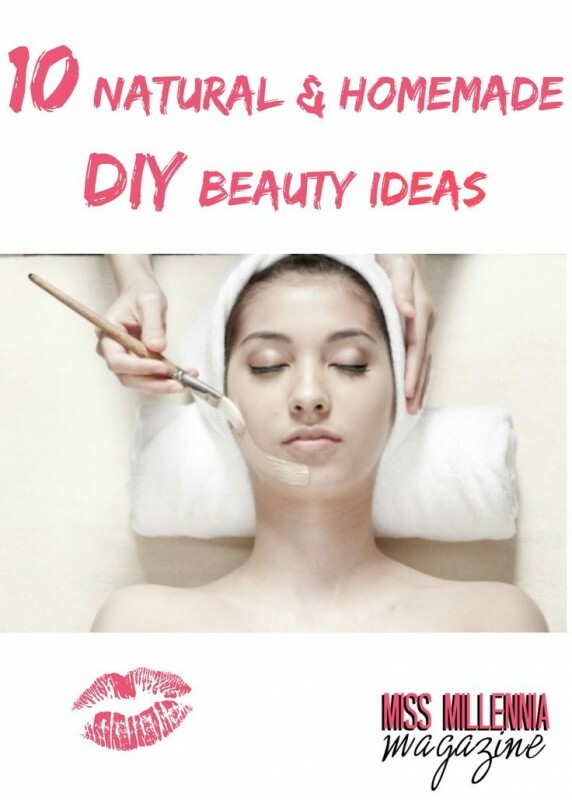 Do you know any other great natural and homemade DIY beauty ideas?